Khan says he's in talks with different trainers; Is Roach about to get dumped? Khan says he’s in talks with different trainers; Is Roach about to get dumped? By William Mackay: Amir Khan (26-3, 18 KO’s) says he’s talking to different trainers, and it’s looking like he may possibly be on the verge of signing up someone new to replace his current trainer Freddie Roach. Khan has lost his last two fights and he wants a trainer that is more available to him so that he doesn’t have wait in line. So there it is. Khan is coming out in the open and admitting that he’s looking to change trainers. It looks like Roach may be on the outs unless Khan is looking to get rid one of his other trainers, such as a strength and conditioning coach. I think it’s more likely that Roach is the one that Khan is looking to replace, and I think it’s probably a wise decision if Khan does do this. He’s lost his last two fights and he can ill afford to lose his next fight or any fights in the near future. Khan’s losses to Lamont Peterson and Danny Garcia seem to suggest that something isn’t working in the training that Khan is getting. Either he’s getting what he needs in terms of expert advice or he’s failing to apply what’s been taught to him. Roach didn’t want to see Khan going out and trying to slug with Garcia in his last fight. For some reason, Khan chose to slug with Garcia anyway and that definitely cost him the fight. Once Khan was knocked down in the 3rd round by a hard left hook from Garcia, the fight was pretty much over, as Khan never fully recovered from that shot. But even when he was hurt, Khan still tried to mix it up with Garcia instead of just hanging on. The big question is whether another trainer can fix Khan’s problems and return him back to where he was before his loss to Peterson. It’s going to take someone really special to teach Khan to stop making so many mistakes in the ring. Maybe Emanuel Steward, Floyd Mayweather Sr or Pernell Whitaker can help him? 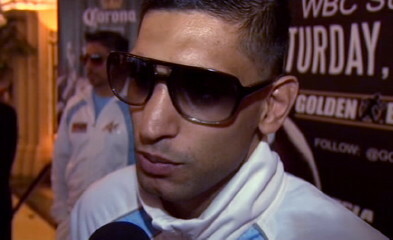 Boxing » Amir Khan » Khan says he’s in talks with different trainers; Is Roach about to get dumped?